That's right, my new book, the cover of which you've seen off to the right of this blog for some time now, will FINALLY be in bookstores in the US tomorrow, March 26. Of course, it is also available at Amazon and other likely outlets on the web. Who knows when reviews and such will begin trickling in. The book was featured in Nature on Thursday in their "Books in brief" section (sorry, you'll need a subscription), but the poor writers of those reviews (I've been one) really have almost no space to say anything. The review does make very clear that the book exists and purports to have some new ideas about economics and finance, but it makes no judgement on the usefulness of the book at all. Anyone in the US, if you happen to be in a physical bookstore in the next few days, please let me know if you 1) do find the book and 2) where it was located. I've had the unfortunate experience in the past that my books, such as Ubiquity or The Social Atom, were placed by bookstore managers near the back of the store in sections with labels like Mathematical Sociology or Perspectives in the Philosophy of History, where perhaps only 1 or 2 people venture each day, and then probably only because they got lost while looking for the rest room. If you do find the book in an obscure location, feel completely free -- there's no law against this -- to take all the copies you find and move them up to occupy prominent positions in the bestsellers' section, or next to the check out with the diet books, etc. I would be very grateful! And I would very much like to hear what readers of this blog think about the book. ... a powerful new type of computer that is about to be commercially deployed by a major American military contractor is taking computing into the strange, subatomic realm of quantum mechanics. In that infinitesimal neighborhood, common sense logic no longer seems to apply. A one can be a one, or it can be a one and a zero and everything in between — all at the same time. ... Lockheed Martin — which bought an early version of such a computer from the Canadian company D-Wave Systems two years ago — is confident enough in the technology to upgrade it to commercial scale, becoming the first company to use quantum computing as part of its business. The article does mention that there are some skeptics. So beware. Ten to fifteen years ago, I used to write frequently, mostly for New Scientist magazine, about research progress towards quantum computing. For anyone who hasn't read something about this, quantum computing would exploit the peculiar properties of quantum physics to do computation in a totally new way. It could potentially solve some problems very quickly that computers running on classical physics, as today's computers do, would never be able to solve. Without getting into any detail, the essential thing about quantum processes is their ability to explore many paths in parallel, rather than just doing one specific thing, which would give a quantum computer unprecedented processing power. Here's an article giving some basic information about the idea. 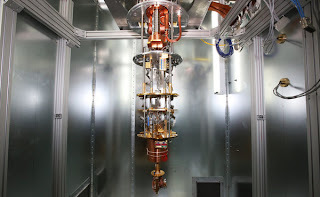 I stopped writing about quantum computing because I got bored with it, not the ideas, but the achingly slow progress in bringing the idea into reality. To make a really useful quantum computer you need to harness quantum degrees of freedom, "qubits," in single ions, photons, the spins of atoms, etc., and have the ability to carry out controlled logic operations on them. You would need lots of them, say hundreds and more, to do really valuable calculations, but to date no one has managed to create and control more than about 2 or 3. I wrote several articles a year noting major advances in quantum information storage, in error correction, in ways to transmit quantum information (which is more delicate than classical information) from one place to another and so on. Every article at some point had a weasel phrase like ".... this could be a major step towards practical quantum computing." They weren't. All of this was perfectly good, valuable physics work, but the practical computer receded into the future just as quickly as people made advances towards it. That seems to be true today.... except for one D-Wave Systems. ... rather than constantly adding more qubits and issuing more hard-to-evaluate announcements, while leaving the scientific characterization of its devices in a state of limbo, why doesn’t D-Wave just focus all its efforts on demonstrating entanglement, or otherwise getting stronger evidence for a quantum role in the apparent speedup? When I put this question to Mohammad Amin, he said that, if D-Wave had followed my suggestion, it would have published some interesting research papers and then gone out of business—since the fundraising pressure is always for more qubits and more dramatic announcements, not for clearer understanding of its systems. So, let me try to get a message out to the pointy-haired bosses of the world: a single qubit that you understand is better than a thousand qubits that you don’t. There’s a reason why academic quantum computing groups focus on pushing down decoherence and demonstrating entanglement in 2, 3, or 4 qubits: because that way, at least you know that the qubits are qubits! Once you’ve shown that the foundation is solid, then you try to scale up. So there's a finance and publicity angle here as well as the science. The NYT article doesn't really get into any of the specific claims of D-Wave, but I recommend Aaronson's comments as a good counterpoint to the hype. Food For Thought commented....Before concluding that economic theory does not include analysis of unstable equilibria check out the vast published findings on unstable equilibria in the field of International Economics. Once again we have someone touching on one tiny part of economic theory and drawing overreaching conclusions. I would expect a scientist would seek out more evidence before jumping to conclusions. "Personally, I consider myself a proud neoclassicist. By this I clearly don't mean that I believe in perfect competition all the way. What I mean is that I prefer, when I can, to make sense of the world using models in which individuals maximize and the interaction of these individuals can be summarized by some concept of equilibrium. The reason I like that kind of model is not that I believe it to be literally true, but that I am intensely aware of the power of maximization-and-equilibrium to organize one's thinking - and I have seen the propensity of those who try to do economics without those organizing devices to produce sheer nonsense when they imagine they are freeing themselves from some confining orthodoxy. ...That said, there are indeed economists who regard maximization and equilibrium as more than useful fictions. They regard them either as literal truths - which I find a bit hard to understand given the reality of daily experience - or as principles so central to economics that one dare not bend them even a little, no matter how useful it might seem to do so." This response fairly well captures my own position. I argue in the book that the economics profession has been fixated far too strongly on equilibrium models, and much of the time simply assumes the stability of such equilibria without any justification. I certainly don't claim that economists have never considered unstable equilibria (or examined models with multiple equilibria). But any examination of the stability of an equilibrium demands some analysis of dynamics of the system away from equilibrium, and this has not (to say the least) been a strong focus of economic theory. 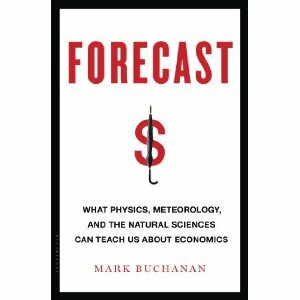 Bloomberg is publishing a series of excerpts from my forthcoming book, Forecast, which is now due out in only a few days. The first one was published today. ...news is now coming out that the Cyprus parliament has postponed the decision and may in fact not be able to reach agreement. They may tinker with the percentages, to penalize smaller savers less (and larger savers more). However, the damage is already done. They have hit their savers with a grievous blow, and this will do irreparable harm to trust and confidence. This weekend, European policymakers opened up a new front in their ongoing war on common sense. The details of the Cyprus bailout included a bail-in of bank depositors, small and large alike. As should have been expected, chaos ensued as Cypriots rushed to ATMs in a desperate attempt to withdraw their savings, the initial stages of what is likely to become a run on the nation's banks. Shocking, I know. Who could have predicted that the populous would react poorly to an assault on depositors? ... The top five banks -- JPMorgan, Bank of America Corp., Citigroup Inc., Wells Fargo & Co. and Goldman Sachs Group Inc. - - account for $64 billion of the total subsidy, an amount roughly equal to their typical annual profits (see tables for data on individual banks). In other words, the banks occupying the commanding heights of the U.S. financial industry -- with almost $9 trillion in assets, more than half the size of the U.S. economy -- would just about break even in the absence of corporate welfare. In large part, the profits they report are essentially transfers from taxpayers to their shareholders. So much for the theory that the big banks need to pay big bonuses so they can attract that top financial talent on which their success depends. Their success seems to depend on a much simpler recipe. This paper also offers some interesting analysis on different practical steps that might be taken to end this ridiculous situation. Just over a week ago, the journal Nature Physics published an unusual issue. In addition to the standard papers on technical physics topics, this issue contained a section with a special focus on finance, especially on complex networks in finance. I'm sure most readers of this blog won't have access to the papers in this issue, so I thought I'd give a brief summary of the papers here. It's notable that these aren't papers written just by physicists, but represent the outcome of collaborations between physicists and a number of prominent economists (Nobel Prize winner Joseph Stiglitz among them) and several regulators from important central banks. The value of insight coming out of physics-inspired research into the collective dynamics of financial markets is really starting to be recognized by people who matter (even if most academic economists won't wake up to this probably for several decades). I've written about this work in my most recent column for Bloomberg, which will be published on Sunday night EST. I was also planning to give here some further technical detail on one very important paper to which I referred in the Bloomberg article, but due to various other demands in the past few days I haven't quite managed that yet. The paper in question, I suspect, is unknown to almost all financial economists, but will, I hope, gain wide attention soon. It essentially demonstrates that the theorists' ideal of complete, arbitrage free markets in equilibrium isn't a nirvana of market efficiency, as is generally assumed. Examination of the dynamics of such a market, even within the neo-classical framework, shows that any approach to this efficient ideal also brings growing instability and likely market collapse. The ideal of complete markets, in other words, isn't something we should be aiming for. Here's some detail on that work from something I wrote in the past (see the paragraphs referring to the work of Matteo Marsili and colleagues). Now, the Nature Physics special issue. By engaging in a speculative derivatives market, players can potentially amplify their gains, which is arguably the most plausible explanation for the proliferation of derivatives in recent years. Needless to say, losses are also amplified. Unlike bets on, say, dice — where the chances of the outcome are not affected by the bet itself — the more market players bet on the default of a country, the more likely the default becomes. Eventually the game becomes a self-fulfilling prophecy, as in a bank run, where if each party believes that others will withdraw their money from the bank, it pays each to do so. More perversely, in some cases parties have incentives (and opportunities) to precipitate these events, by spreading rumours or by manipulating the prices on which the derivatives are contingent — a situation seen most recently in the London Interbank Offered Rate (LIBOR) affair. Proponents of derivatives have long argued that these instruments help to stabilize markets by distributing risk, but it has been shown recently that in many situations risk sharing can also lead to instabilities. It now seems that the proliferation of financial instruments induces strong fluctuations and instabilities for similar reasons. The basis for pricing complex derivatives makes several conventional assumptions that amount to the notion that trading activity does not feed back on the dynamical behaviour of markets. This idealized (and unrealistic) model can have the effect of masking potential instabilities in markets. A more detailed picture, taking into account the effects of individual trades on prices, reveals the onset of singularities as the number of financial instruments increases. The remainder of the paper goes on to explore various means that may be taken, through regulations, to try to manage the complexity of the financial network and encourage its stability. Stability isn't something we should expect to occur on its own. It demands real attention to detail. Blind adherence to the idea that "more derivatives is good" is a recipe for trouble. The second paper in the Nature Physics special issue is "Reconstructing a credit network," by Guido Caldarelli, Alessandro Chessa, Andrea Gabrielli, Fabio Pammolli and Michelangelo Puliga. This work addresses an issue that isn't quite as provocative as the value of the derivatives industry, but the topic may be of extreme importance in future efforts to devise effective financial regulations. The key insight coming from network science is that the architecture of a network -- its topology -- has a huge impact on how influences (such as financial distress) spread through the network. Hence, global network topology is intimately linked up with system stability; knowledge of global structure is absolutely essential to managing systemic risk. Unfortunately, the history of law and finance is such that much of the information that would be required to understand the real web of links between financial institutions remains private, hidden, unknown to the public or to regulators. The best way to overcome this is certainly to make this information public. When financial institutions undertake transactions among themselves, the rest of us are also influenced and our economic well being potentially put at risk. This information should be public knowledge, because it impacts upon financial stability, which is a public good. However, in the absence of new legislation to make this happen, regulators can right now turn to more sophisticated methods to help reconstruct a more complete picture of global financial networks, filling in the missing details. This paper, written by several key experts in this technical area, reviews what is now possible and how these methods might be best put to use by regulators in the near future. Finally, the third paper in the Nature Physics special issue is "The power to control," by Marco Galbiati, Danilo Delpini and Stefano Battiston. "Control" is a word you rarely hear in the context of financial markets, I suppose because the near religion of the "free market" has made "control" seem like an idea of "communists" or at least "socialists" (whatever that means). But regulation of any sort, laws, institutions, even social norms and accepted practices, all of these represent some kind of "control" placed on individuals and firms in the aim, for society at large, of better outcomes. We need sensible control. How to achieve it? Of course, "control" has a long history in engineering science where it is the focus of an extensive and quite successful "control theory." This paper reviews some recent work which has extended control theory to complex networks. One of the key questions is if the dynamics of large complex networks might be controlled, or at least strongly steered, by influencing only a small subset of the elements making up the network, and perhaps not even those that seem to be the most significant. This is, I think, clearly a promising area for further work. Let's take the insight of a century and more of control theory and ask if we can't use that to help prevent, or give early warnings of, the kinds of disasters that have hit finance in the past decade. Much of the work in this special issue has originated out of a European research project with the code name FOC, which stands for, well, I'm not exactly sure what it stands for (the project describes itself as "Forecasting Financial Crises" which seems more like FFC to me). In any event, I know some of these people and apart from the serious science they have a nice sense of humor. Perhaps the acronym FOC was even chosen for another reason. As I recall, one of their early meetings a few years ago was announced as "Meet the FOCers." Humor in no way gets in the way of good science. I'm with Elton. This writer, it seems to me, is up to no good, trying to pull the wool over the reader's eyes, using confusion as a weapon to persuade the reader of his superior insight. You read it, you don't quite get it (or even come close to getting it), and it is then tempting to conclude that whatever he is saying, as it is beyond your vision, must be exceptionally deep or subtle or complex, too much for you to grasp. You need some self confidence to come instead to the other logically possible conclusion -- that the text is actually purposeful nonsense, all glitter and no content, an affront against the normal, productive use of language for communication, "crack cocaine" as the writer gets the high that comes from appearing deep and earning accolades without putting in the hard work to actually write something that is insightful. Having said that, let me also say that I am not in any way an expert in postmodernist philosophy and there may be more to the thinking of some of its representatives than this Guattari quote would suggest. ... the most remarkable thing about Mr Buffett’s achievement is not that no one has rivalled his record. It is that almost no one has seriously tried to emulate his investment style. The herd instinct is powerful, even dominant, among asset managers. But the herd is not to be found at Mr Buffett’s annual jamborees in Omaha: that occasion is attended only by happy shareholders and admiring journalists. If he is a genius, it is the genius of simplicity. No special or original insight is needed to reach his appreciation of the nature of business success. Nor is it difficult to recognise that companies such as American Express, Coca-Cola, IBM, Wells Fargo, and most recently Heinz – Berkshire’s largest holdings – meet his criteria. ... Which leads back to the question of why Berkshire has so few imitators. After all, another crucial insight of business economics is that profitable strategies that can be replicated are imitated until returns from them are driven down to normal levels. Why do the majority of investment managers hold many more stocks, roll them over far more often, engage in far more complex transactions – and derive less consistent and profitable results? ... the deeper issue is that complexity is intrinsic to the product many money managers sell. How can you justify high fees except by reference to frequent activity, unique insights and arcana? But Mr Buffett understands the limitations of his knowledge. That appreciation distinguishes people who are very clever from those who only think they are. One final comment. I think finance is rife with this kind of psychological problem. But I do not at all believe that science is somehow immune from these effects. I've encountered plenty of works in physics and applied mathematics that couch their results in beautiful mathematics, demonstrate formidable skill in building a framework of theory, and yet seem utterly useless in actually solving or giving insight into any real problem. Science also has a weak spot for style over content.